Find a vegan version of this recipe here. In cooking, sometimes, the whole is greater than the sum of its parts. A few years back, in Greece, I had a Greek Salad. I was on a remote Greek Island, on a remote beach at the very end of the bus line. There were almost no tourists there, and only once place to buy things to eat. I ordered a Greek Salad, and ate it, with my fingers, sitting on the beach. It was incredibly simple: peppers, onions, tomatoes, feta cheese, olive oil, lemon juice and oregano, but the combination, along with the view, made it one of my favourite meals of all time. 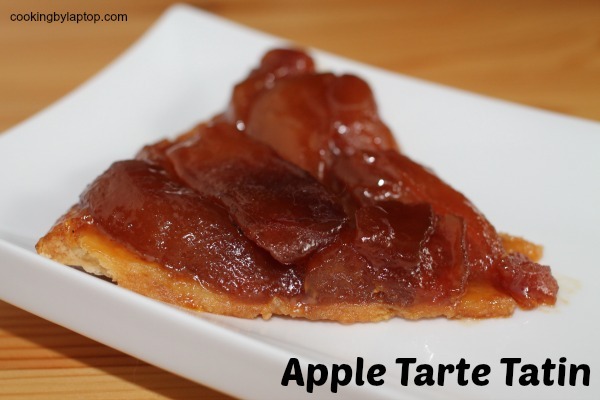 Apple Tarte Tatin is an old French dessert. It is, in essence, the French version of an apple pie. It contains 4 ingredients (not including the crust): apples, sugar, butter and lemon. But the end result is a luscious, almost-candied fruit that really is elevated so far beyond the humble apple. This recipe is all about technique, and it’s not easy. This is for those of you who like a challenge. I have tried making this a few times already, but only recently had success. There are a lot of steps, and caramel is notoriously finicky (and dangerous! it’s very easy to burn yourself). I wanted to master (hehe) Julia Child’s version, to start, but now that I feel like I’ve conquered that, I’m working on another version with quince and pears. Stay tuned. By the way, if you want to eat this without all the work, I recommend The Truffle House in Dundarave. Peel and core the apples, then slice them. I used my hand-dandy OXO Good Grips Apple Divider for this. Toss the apples into a bowl with the lemon juice and 1/2 a cup of sugar. Toss well, then allow to sit for 20 minutes. While the apples are macerating, you can start on the caramel. I used my old cast-iron frying pan for this. You need to use a frying pan that go into the oven, so no wooden or plastic handles. Melt the butter over medium-high heat, and then add the remaining cup of sugar. Keep stirring and working the caramel until the sugar is all melted into the butter, and then keep working it until it is… well… caramel in colour. Mine was a bit thick, and felt a little grainy, so I added a tablespoon of water here and there until I felt it achieved the right syrupy consistency. You have to really babysit the caramel so that it doesn’t burn, but if you stir it constantly, it may take a long time to cook, so you can leave it for a moment or two at a time, then go back to stirring it. Don’t check your email, though. This should take about 15-20 minutes. Once the caramel has achieved perfection, take it off the stove and let it cool a little. Drain the apples. Arrange the apples in a circular pattern on top of the caramel. You should have enough for two layers of apples. Return the pan to the heat, and allow the caramel to cook around the apples. Cover after 10 minutes, and allow to cook for about 10-15 minutes more. Every few minutes or so, push the apples down into the caramel with a spoon, squishing the juices from the apples out and allowing them to mingle with the caramel. After about 20-25 minutes, the caramel will be thickened, and the apples will be cooked down. Remove from heat. Cover the apples with your pastry (cut in a circle), and tuck it under the apples on the edges of the pan if possible. Bake in a pre-heated 350 degree oven for an additional 20 minutes, or until the crust is golden. Remove from the oven, and allow to cool so it is handleable. Place a large plate on top of the frying pan, and carefully flip it. The tarte tatin should now be crust-side down on the plate. Slice and serve with whipping cream or ice cream.